Whole fish scares me. In a restaurant, it’s heavenly but at home, being prepared in my own kitchen, it’s more than a little daunting. In my efforts to consume more fish, I’ve determined $30/lb scallops and added cost fish fillets are not very economical. I needed to try making a fish. While I’m a huge fan of fresh fish from the greenmarkets (like the dirt cheap but delicious mussels I bought this morning), I doubt they have time to debone my fish with the 10 minute line behind me. Deboning is the next hurdle, don’t worry, but for now, I’ll just deal with cooking the whole thing. 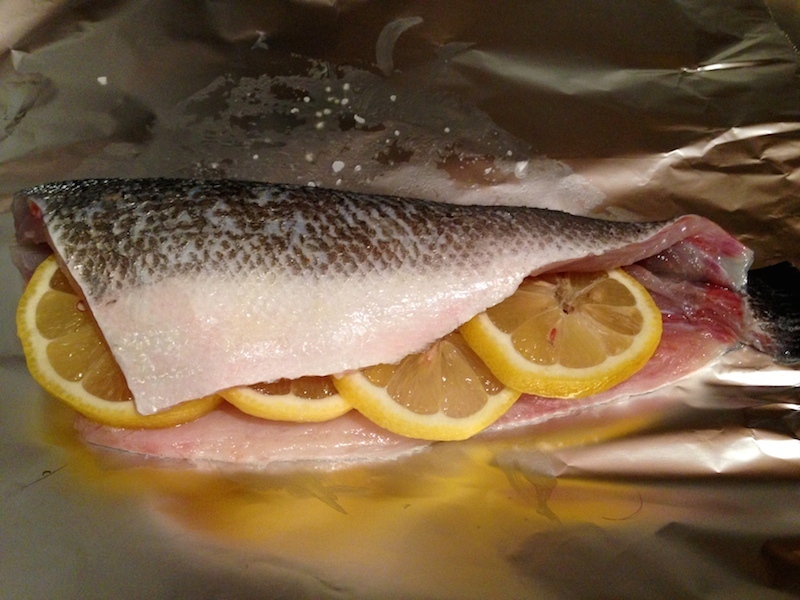 I lucked out with local Bronzino from Fresh Direct where they would handle the deboning step for me. Fish and tail on? So many blogs urge you to keep the fish heads–good for stock!–but a bit too creepy for me. While I believe in staying connected to where my food comes from, staring it in the eye, literally, doesn’t really do it for me. 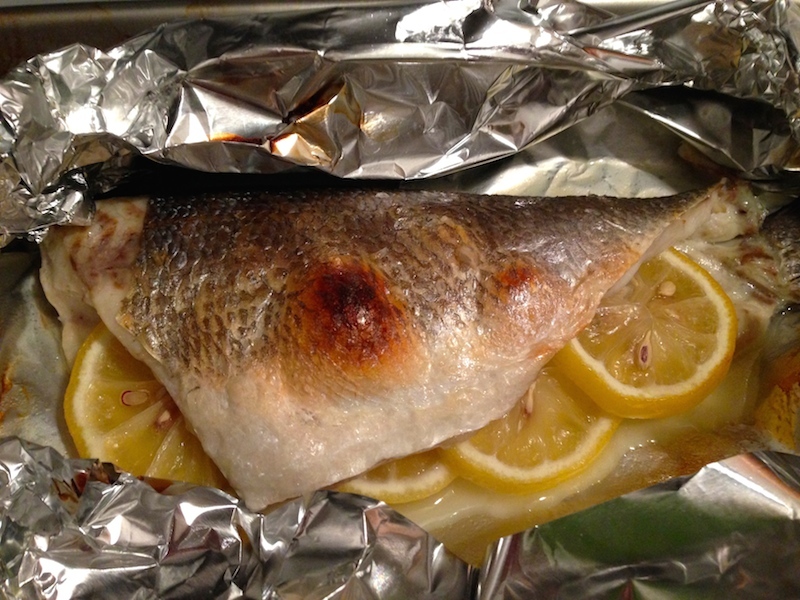 In my search for easy recipes to cook whole fish, I was surprised to find that I could keep my basic oil and lemon juice method, just coating the inside of the fish, rather than the outside. 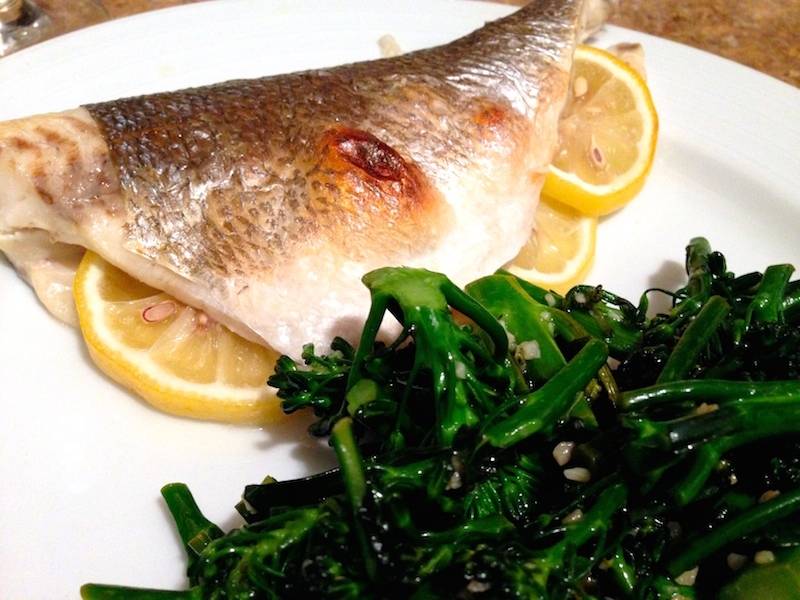 With one simple trial, I quickly got over my fear of cooking whole fish. So easy! And so fast! I’d love to say it takes less time to cook the fish than it does to eat, but we’re pretty fast eaters. Next adventure, on to deboning. Preheat oven to 400°F. In a small bowl mix together olive oil, sea salt, ground pepper and garlic powder. Tear two pieces of aluminum foil, large enough to completely encase each fish. Place fish on foil and brush inside generously with olive oil mixture. Fill with half of the lemon slices. Repeat with second fish. 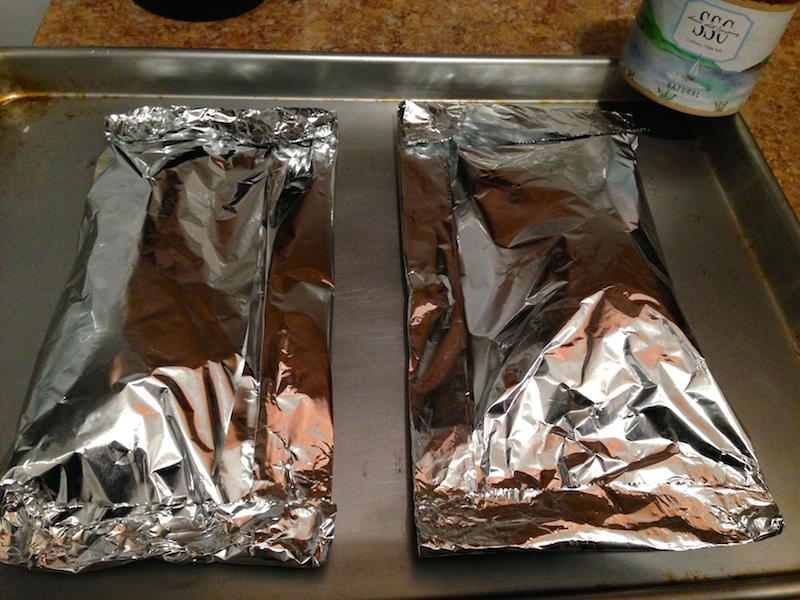 Fold foil over fish, closing all sides like a package, place wrapped fish on a rimmed baking sheet and bake f0r 20 minutes. Unwrap fish, let sit 5 minutes then serve with your favorite vegetable. In my case, I went with broccoli rabe, sautéed in olive oil, garlic and salt. I also don’t do whole fish at home. Part of my problem, this sounds stupid is that I don’t like looking at the head (eyes) and I have a terrible fear of fish bones. I watched my brother almost die when he got a fish bone caught in his throat, we were children but it stuck with me for the rest of my life. That said I love whole fish in a restaurant where the waiter carefully removes the bones and gives me the filet. The heads are creepy, but I love whole fish. It really is super easy to make once you find the courage to do it. Where do the parsley and rosemary go?